Wow! An awesome 3-D animation short, "The Boxer" is packaged in a production that explains the processes of bringing "virtual actors" to life. First, the short: Brilliantly composed, carefully, artfully shot (camera angles etc.) with fantastic caricatures. The movement, the lighting, the action, the story are woven together so intelligently that they produce a simply 100% entertaining twenty minutes at the Big Screen. The characters are reminiscent of those in "Toy Story" (in fact, one of the voice actors stated that the creator of "Boxer" pretty much laid the ground work for "Toy Story" and the films in that genre that followed). Following the short, two virtual actors walk the audience through the steps necessary to create a pixel person from gridding to rendering to painting to animating. Not only educational, but in an entertaining, "Academy Award" kind of way. I enjoyed all of the actors, but the female presenter seemed inconsistently stiff, her facial features leaned towards lizard like. The only other area for improvement -- though very likeable, the boxer's verbal antics became a bit repetitive and approached annoying as the educational portion neared the end. 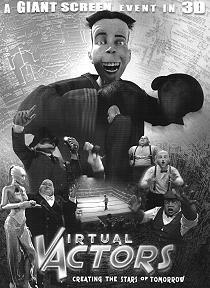 Oh, and "Virtual Actors" may be dead-on as a descriptive label - but it belies the pizzazz of the production it titles. Besides the obvious, the virtual stage and background for the presenters shimmers in creativity. Each fan in the boxing arena appears to be cheering and waving arms in his/her unique fashion. Though looming in the darkness, this crowd adds a great deal to the action in the foreground. Virtual Actors. Copyright © 2004. Starring the voices of Philippe Begeron, Aron Tager, Caroline Ambrose, Vincent Corazza, Andre Sogliuzzo, Kevin Michael Richardson, Kevin Dorsey. Screenplay by Philippe Begeron and Pierre Lachapelle. Produced by Pierre Lachapelle at TFX Animation.